How do you pick between an acoustic guitar and an acoustic electric one? Or, is it electro-acoustic? Confused? They look the same, but do they sound the same? Let’s clean up that confusion and give you a head start on comparing the two guitars. By the end of this, you’ll know which one will best fit your strumming needs! We already know what an acoustic guitar is, and as you can see, the two types of guitars look pretty much the same. So, what is the difference between acoustic and acoustic electric guitars? The Piezo pickup is definitely the most common type of pickup that’s used in an acoustic-electric guitar. Some guitars with advanced electronic pickup systems will incorporate a Piezo pickup, microphone, and sensors. Along with the pickup system, an acoustic electric guitar will require a built-in preamp. The preamp amplifies the signal received from the transducer (pickup) before its sent to your amp. The on-board preamp often comes with tone controls, equalizers (usually seen with 3 frequency bands), and a built-in tuner. The preamp system does require a power source, which is why you often see batteries of various types included in the purchase with an acoustic-electric guitar. Why play an acoustic-electric guitar? Why not? 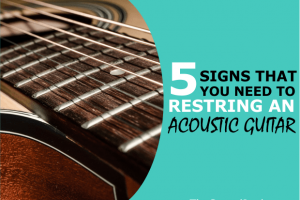 While an acoustic guitar is the timeless instrument that paved the way for many variations of electro-acoustic and electric guitars, it can’t quite cut the mustard when you want to go “live” or perform anywhere outside of your bedroom. With an acoustic, you’re limited to static movement on stage (in front of a mic), inadequate sound projection in large areas, and limited acoustic, harmonic overtones. While the last reason isn’t a bad thing, an electro-acoustic guitar does offer more sound options. This really isn’t a debate at all, since it’s about your personal preferences. However, the versatility and advantages of owning an acoustic electric guitar do lean heavily on the winning side. But, for a beginner, there’s a lot of factors to consider. Let’s discuss them here. Admit it, this is definitely one of the first things you’re going to look for when buying a guitar. But, if you’re hoping it’s the make-it or break-it decision, you’ll be disappointed. Both acoustic and electro-acoustic guitars can be made out of the same tonewoods, sport the same shape, and even have identical finishes. Again, both guitars can come in the same shape, size, and form to suit your playing style and comfort. However, the acoustic electric guitar does stand out a little brighter in this section. Because you have the ability to amplify your sonic projection with the pickups, you can scale down in size and increase your comfort with ergonomic cutaways. In an acoustic, you’re reliant upon the size and shape for sound projection regardless of your height, arm length, comfort, and frame. Acoustic guitars have been used by beginners for five centuries. How do you compete with that? Well, it’s really about the strings and quality of the guitar as a whole. Nylon strings are softer on the fingers, that’s why many beginners go for the electric guitar, but they don’t produce nearly as loud a sound as steel strings, again – solved by electric guitars. Steel strings are often said to be harder to play by beginners, but it helps to “break you in.” This is where action comes in. You can play both an acoustic or acoustic electric guitar with medium to low action and light strings and both would be suitable for a beginner player. An acoustic-electric guitar has the ingenious design of being both an acoustic in its basic function while having the ability to be plugged in for maximum volume projection. We all know that a newbie will appreciate this because you’ll want to strut your stuff whenever and wherever you can! However, when you’re at a campfire or at the beach, your acoustic-electric is limited to an acoustic only. This may be where the acoustic gets an upper-hand in this race. Sometimes, you don’t know where you’re going or where you’ll end up, and having to tote the extra equipment needed to plug in can be an inconvenience, especially when there isn’t a place to plug in. No problem, just play acoustic, right? Yeah, but you’ve still got your unused baggage you have to carry around because you didn’t plug-in. An acoustic on the other hand? No extra equipment, no toting, and no baggage. You know what to expect wherever you unexpectedly end up! Acoustic music magic. As mentioned earlier, an acoustic-electric guitar can cost the same as an acoustic guitar or barely a fingernail’s length more. But, that is all subjective when you’ve got brands, quality, and features to filter through. So, they’re at a tie here. But, to get amplified sound from your acoustic-electric guitar, you do need to purchase extra equipment. Whether it be as a complete equipment and accessories package or you buy them separately, you’re still dishing out more cash for more stuff. Between the two instruments, was it really a race to begin with? They’re the same in nature, but one has the ability to be plugged in. Of course, the advantages you’re gaining with an acoustic-electric guitar may swing you this side of the fence, but it’s by no means a reason to discredit the time-honored acoustic. Consider realistic use and expectations for your guitar and you’ll find that choosing your instrument will be much easier. But, we will say “amp it up” if we can’t hear you, and if you can’t, maybe you should’ve gone with an acoustic electric guitar!